Cooking seasonally is a tricky thing–especially if your season currently includes hurricanes or extreme heat. Pasadena has finally cooled down to 80s/90s with a bit of cloud cover, but last week’s 105-degree afternoons were a serious challenge. It was so bad the only time to go out for a walk was about 5:30 in the morning. Hard to think school has been in session for a month, it’s already September, and Rosh Hashanah is a week and a half away. Running the oven is, to put it bluntly, not an option, and the stove top isn’t much better in my small and easily overheated galley kitchen. Microwaving is a powerful way to cut the time and pain (and airconditioning bills) for bulk cooking of things like vegetables, rice, pasta…and dried beans, which are much cheaper and more versatile (and much lower in sodium) than canned. Make a bean stew or chili and you can zap a portion of it at will later in the week. Plus bean salads can be served cold–a plus for weeks like the ones we’ve had recently. But for microwaving, you usually have to adjust whatever method is spelled out in a recipe to your oven, your containers, your food quantities. Microwave times are sensitive to all of those factors, plus how much water you have (water’s the main molecule microwave radiation acts on) and whether or not you’ve got a lid. Most people don’t try to make changes based on their first-run results and most cookbooks never really explain how to make useful adjustments. Predictably, most microwave cookbooks end up in the Last Chance bin at your local Friends of the Library booksale. It’s a shame, because once you’ve got your timing and so on down, you can repeat it with reliable results. Over the years I’ve posted basic heat-to-simmer-and-let-sit-to-absorb microwave methods for cooking split peas, chickpeas, lentils and other bulk dried beans. Lentils and split peas always did work out well without needing to soak them first–they tend to be easier to cook quickly by standard stovetop boiling too. Chickpeas work okay if you presoak them or hot-soak in the microwave (heat briefly in water just to cover, let stand 15 minutes or so and let them swell up) before the main cooking, and adding a dash of baking soda to the soak water really helps. Same with gigantes (giant favas)–which I’ve now decided cook better with the skins left on, same as if you were boiling them, and they’re certainly a lot quicker and easier to peel afterward–also more fun. But some beans just seem to toughen if you don’t presoak overnight or if you microwave them too long. 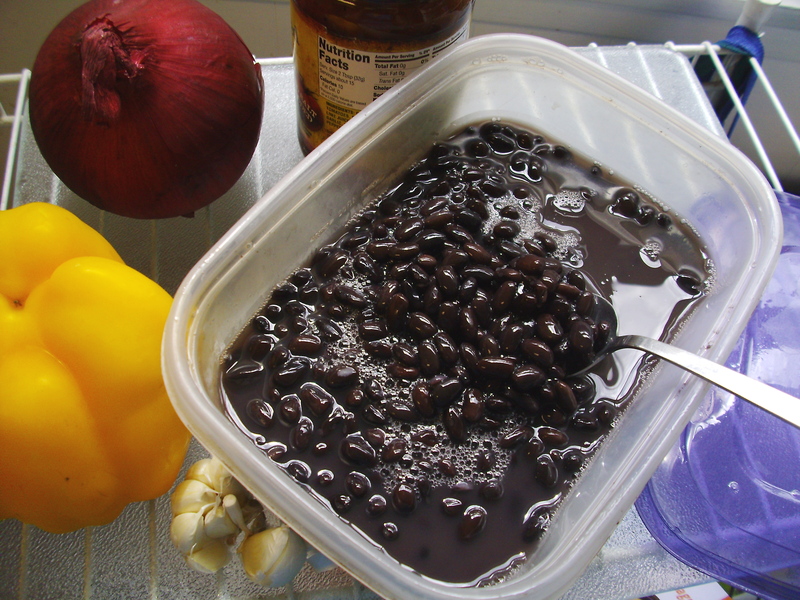 Black beans and kidney beans have given me more trouble than they seem to be worth–and I’m a bit reluctant to post this because it’s fussier than I like to admit even after adjusting the method successfully. Microwaving isn’t supposed to take more time and fuss than straight boiling on a stove, or working with a pressure cooker, if you have and trust yourself with one. But this is a good illustration of how to use a microwave as a workaround when you don’t, and it shows you how you might think about making adjustments based on what the food is doing or not doing. So after a rethink of my previous methods, I’ve made some changes to the way I cook black beans from scratch by microwave. It also works for things like brown rice, steelcut oats, and other tough, uncut, unpeeled whole grains like farro or pearl barley when you’ve forgotten to put them up for soaking overnight, and at least for the rice it’s quicker than the 45 minutes or so of my previous brown rice method–maybe 20-30 minutes for a pound or two of brown rice. For the beans, maybe an hour of time total, with sitting and rechecking. Maybe less if your beans are fresh enough and/or you remembered to soak them overnight first. And now that school’s out, it’s hot. 107 degrees twice this week in Pasadena, smoke in the air from the San Gabriel fire not too far away, and no desire to cook, walk during the day, or listen to anything resembling hot air. Because the recent spate of presidential campaigning has become poised to take away almost any American’s appetite for a while. Just read a newspaper online and look at the prominent photos and bombastic quotations and examples of rank cowardice. I mean, yeah, I voted in the California primary two weeks ago, and I even researched all the local judges and assemblypeople for my district this time, hoping to make something count or at least not to commit any hideous mistakes. Contrary to what you might think, reading the candidates’ own statements will actually give you a feel for what kind of people they are, whether they give a flying leap about their prospective constituents and whether they know how to tie their own shoes. Reading through about fifteen last-minute write-in candidate statements for various assembly-and-county-supervisor-type posts was pretty entertaining, actually–most of the hopefuls (you could guess which parties) stated their qualifications as “I believe in God.” Seriously. Sum total. Nationalistic and bigoted fervor seem to be going around, though. To wit, “Brexit”, which actually won the vote today. Not that I don’t understand Britain’s–and everyone else’s–frustration with the EU administration, but the vote results and the resulting–utterly predictable–mess announced this morning are really disheartening. So is it any wonder I feel like taking a major break from my computer, my kitchen, and possibly your kitchen as well? If only to soothe your eyeballs and your rapidly developing ulcer, for which I apologize profoundly. Oy. Now that that’s over, I guess I have no more excuses. What was I going to post all this time, anyway? Harking back to early April, it looks like I made a couple of tries at something about microwaveable side dishes for Passover seders. Yes, it’s now too late to care where I hid the afikoman, but I maintain that the ability to microwave greens like asparagus or broccoli to perfection in a couple of minutes at the drop of a hat can save a meal–Passover or not–and some heat in the kitchen. If you’re vegetarian or leaning toward it, some of the not-chicken microwaveable soups can also be kind of handy and quick to nuke and store in those big snaplock containers in the fridge and free up your stove. I didn’t go so far as to try any microwave matzah balls. No idea whether that would be a great idea or a terrible one, I was too not-chicken to try it. What can I say–be relieved. Be very relieved. However, a crustless Israeli-style spinach and feta casserole, basically a quiche but more rustic in texture, was a hit both conventionally baked and browned for a Saturday congregation lunch during Passover and later for us at home via the quickie microwave method (minus the crust, so you don’t need the oven at all). It’s less glamorous-looking, more get-it-on-the-table-and-don’t-heat-up-the-house. Unfortunately for the spinach and feta thing, it turns out there are a gazillion of these posts all over the web, especially on low-carber fitness sites. Which takes away some of the charm of posting about it. But it’s still a good and very simple dish. 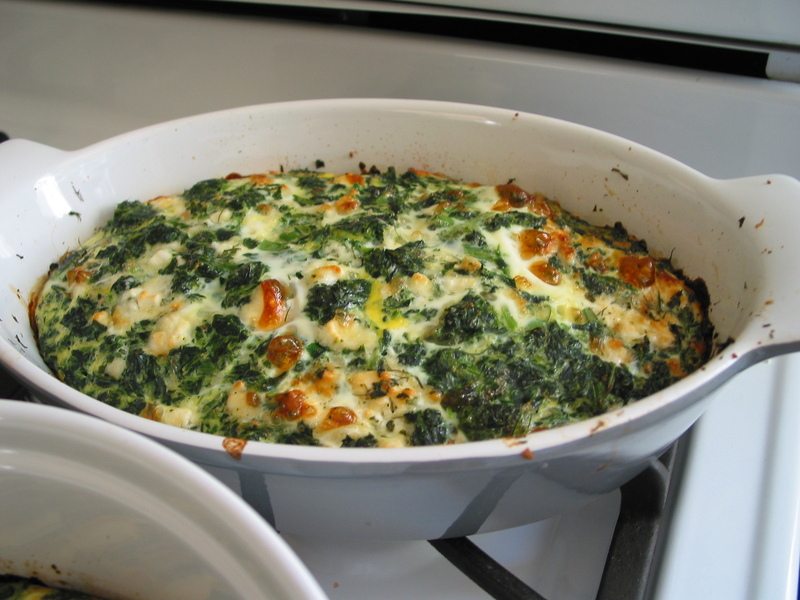 Toss the spinach, herbs and feta lightly in the casserole dish so there are visible clumps of cheese (i.e., don’t blend it too fine), mix the eggs and milk together and pour them over. Optional–grate or sprinkle a pinch of nutmeg on top. Either bake about 35-45 minutes at 350F, which makes it all pretty, puffed and browned on top, or (as I see it, the better option for Pasadena weather), just nuke it covered in a microwaveable stoneware casserole for about 7-8 minutes until puffed and cooked through to keep your kitchen from sweltering. …Are we sensing a theme here? I hope so–because yes, it’s actually been 107 degrees this week in Pasadena. I’m not that good at keeping my cool or not cooking at all (don’t ask about the sourdough I “rescued” by baking around midnight with all the doors and windows open when the temperature dropped below 90…) But I’m trying hard not to cook. When it’s this hot, dinner becomes a pastiche of sort-of-niçoise salads with beans or canned tuna added, maybe some cold hard-boiled or medium-boiled eggs. I’m also not above making a dinner of wedges of leftover cauliflower omelet reheated (or not) in the microwave, and either tomato-cucumber salad or some sliced tomatoes with vinegar, olive oil, maybe basil flowers from the struggling plant outside. 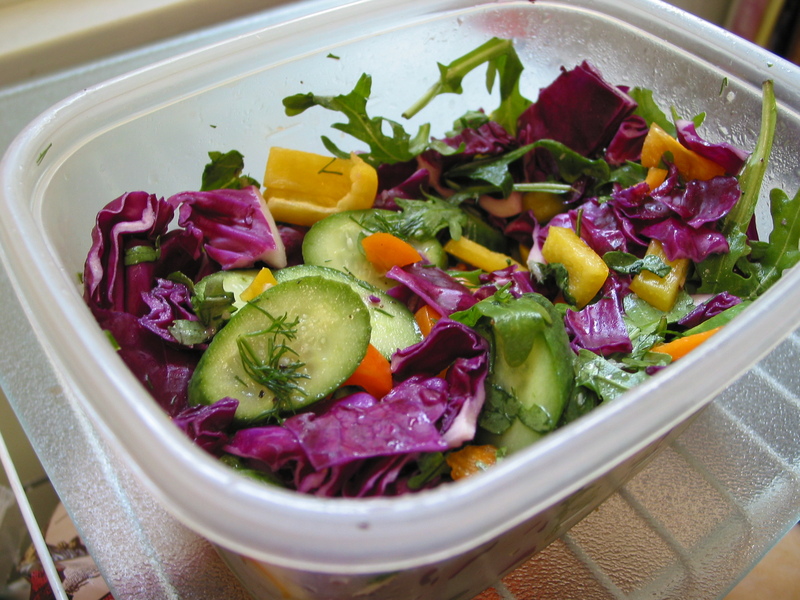 The big box of grab-and-go salad vegetables is still looking like a good strategy too–veg that doesn’t wilt in an instant is as valuable in summer as in winter. As is shredded Greek cabbage salad. Cold raw or microwave-blanched green beans, romano beans, cauliflower or broccoli with mustard dressing, Italian-type vinaigrette, or a yogurt-based dip is also a relief. Here are a few other hot weather ideas dragged from the depths of my blank-book cookbooks, which I now realize I’ve been keeping more than half my life. 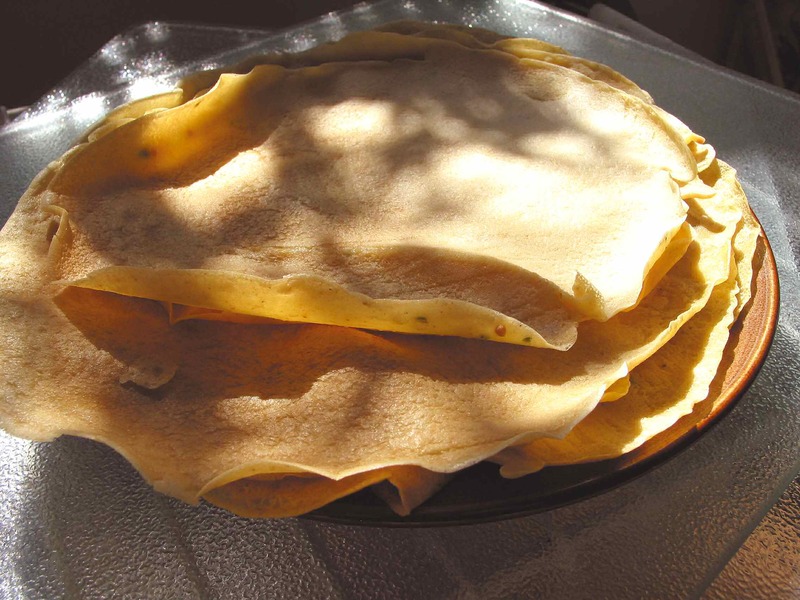 Project 1 of Panic Week: “instant” dosas made with chickpea flour, rice and yogurt. The heavy dose of mustard seed and black pepper is surprisingly good. Planning the cooking for Passover usually means thinking about the week itself, buying matzah and gefilte fish and horseradish and so on. But for me, it also means using up the open bags of flour, beans, rice and pasta, plus whatever yogurt, cheese and milk I have left, and yet not overdosing on starches. And I’ve just gotten the taxes done, so it’s time to look in the fridge and panic. 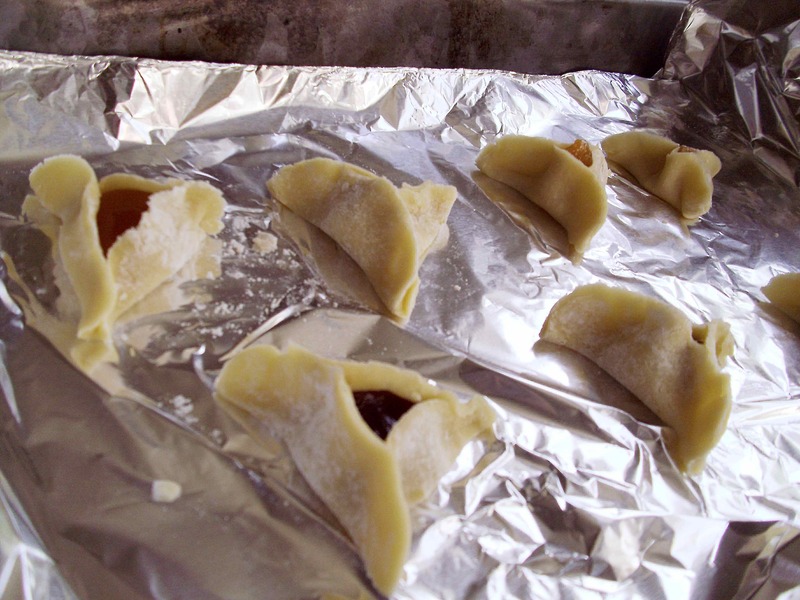 We’ve got just over a week to go before Passover, and there’s still a lot of chametz in the house…a pack of fillo (luckily only one), a pound each of dried chickpeas and red lentils, a bag of mung beans I don’t really know how to use, some rice, a bowl of dough…wonton wrappers. Chickpea flour! Rye flour! Why did I leave it all this long [breaks down and bangs head against wall for a second]? I don’t usually want to cook or serve that much starch in a single week, but at least most of it is legumes with some fiber and protein. So I’ve been thinking about foods–both chametz and not-chametz–that don’t have to be devastating dietwise or empty your wallet or take forever and a half to cook. Because even with snow on the ground all over the east coast, where my mom and my sister and most of my old friends are still shoveling it out of their driveways this late in March, Pesach is coming. And then maybe an actual spring with shorts weather? We can only hope! Time to lighten up in anticipation. This week I’ve decided to post the chametz countdown (aka, “Panic Week”), and the next week or so, a couple of attempts at a Pesach week with mostly fresh, simple foods and a lot more vegetables, and without the usual total matzah-on-eggs-on-more-starch-and-potatoes-and-choke-cake-and-too-many-canned-macaroons kind of meal plan…can it be done? I think so. As long as I don’t let my husband do the shopping. Can it be done in a microwave? I’m counting on it. I was originally going to call this post “Nappa 9-1-1” because it’s about salvaging a cabbage quickly and semi-artfully from the back of my fridge, but realized how bad that would be once I read the recent earthquake damage assessments up in the real city of Napa from the 6.0 earthquake a couple of weeks ago. Things are still kind of rough up there. The Napa Valley Vintners association have donated an impressive amount–$10M–and have instructions on how to donate to the local community disaster relief fund. You can find a number of local funds to donate to online at norcalwine.com. I love bringing home a bag (or more) of produce from my local greengrocer each week–especially in the summer, when Fresno tomatoes are in and brilliant red, green beans are green and snappy, apricots and plums and pluots are spilling ripely out of the bins at under a dollar a pound, and herbs like purple basil and tarragon and mint and za’atar are 75 cents a bunch. You can’t help but feel like you’re going to be a great cook that day, just by cutting up a few vegetables and sprinkling on some oil and vinegar and strewing herbs (and feta or Alfonso olives) on top. I always mean to use up all my vegetables before they start showing their age, but occasionally I get caught with something unintended at the back of the fridge. This week it was a Nappa cabbage, which is longer and less sulfurous (when lightly cooked) than the more traditional green and Savoy cabbages. A little closer to bok choy. So I peeled back the rusted layers, hoping that some of the inner leaves could be salvaged, at least, and I got fairly lucky. 1. Vegetarian (not a big beef fan, personally)–I’m using the lentil/rice stuffing I developed for stuffed eggplants and onions three years ago (has it already been that long??? ), because I actually made stuffed onions again last week and had some leftover stuffing in the fridge. 4. 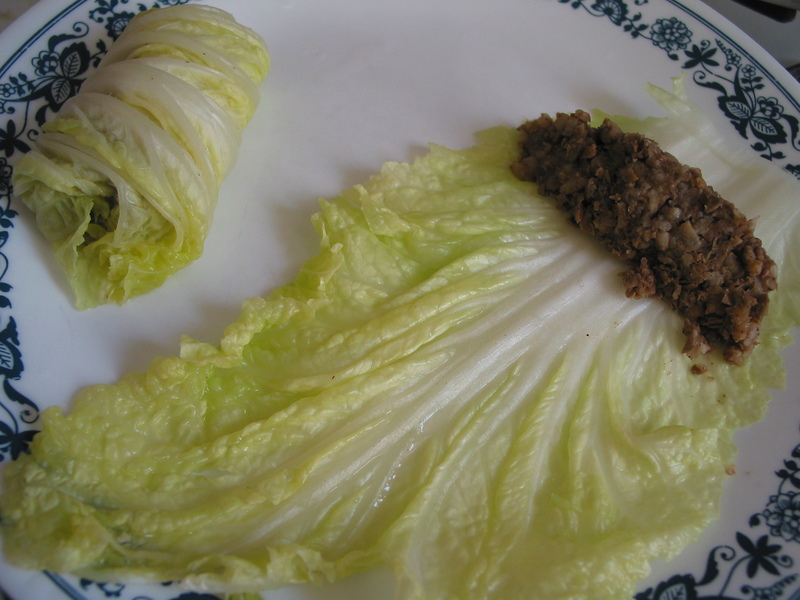 Bridges the cultural/culinary gap between European and Syrian Jewish versions of stuffed cabbage by spicing the filling AND adding garlic and onions. It can be done, and should. And yet, I’m not stewing it to death (actually, that means overturning both Euro and Syrian traditional cooking methods in equal measures). 5. Fulfills the Prunes and Lentils Challenge, or at least hints at what’s possible, since today I had (gasp) no prunes left and had to resort to leftover tamarind sauce from the aforementioned batch of stuffed onions… close enough for folk music. 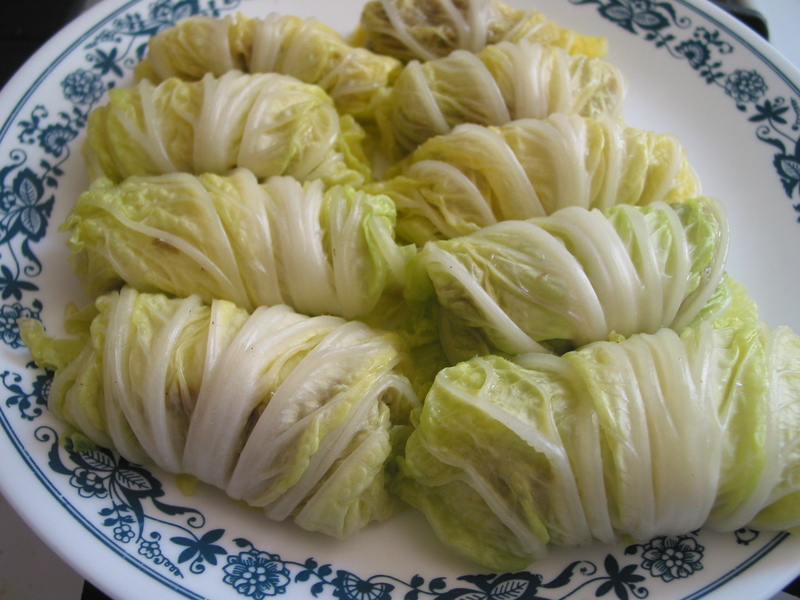 Stuffed cabbage rolls, as I’ve noted before, are popular throughout at least eastern Europe and Syria. Most versions contain meat–beef for Jews, beef or lamb for Arabs, some mixture of pork and beef for European Christians. But I’ve also seen some really beautiful-looking vegetarian ones in Nur Ilkin’s The Turkish Cookbook, and those were stuffed–of all things–with whole cooked chestnuts. Cabbage lends itself to enveloping stuffings almost as well as grape leaves, and it’s easier to work with, cheaper, and (big bonus) unbrined. In addition to meat or lentil fillings, you could try something like curry-spiced or Mexican-style beans and/or vegetables, a mu shu or samosa filling, whole cooked grains like brown rice or bulgur with or without dried cranberries or raisins and sunflower seeds or chopped nuts, maybe even fish (though I’m shying away from Joan Nathan’s recommendation for wrapping up gefilte fish and giving them the stuffed cabbage treatment). Perhaps for fish I’d want smoked (fake or real) whitefish salad. Or sausage–real or vegetarian, smoky and spicy. It seems to me for sauces you could go well beyond sweet-and-sour traditional: a garlicky tomato sauce, a mustard vinaigrette, a smoky salsa with or without tamarind sauce, a chili-paste or z’khug-laden soy/molasses/vinegar/sesame oil dipping sauce with ginger and scallions, a polished herb and wine-type tomato sauce with prunes or mushrooms and onions, even (maybe definitely?) 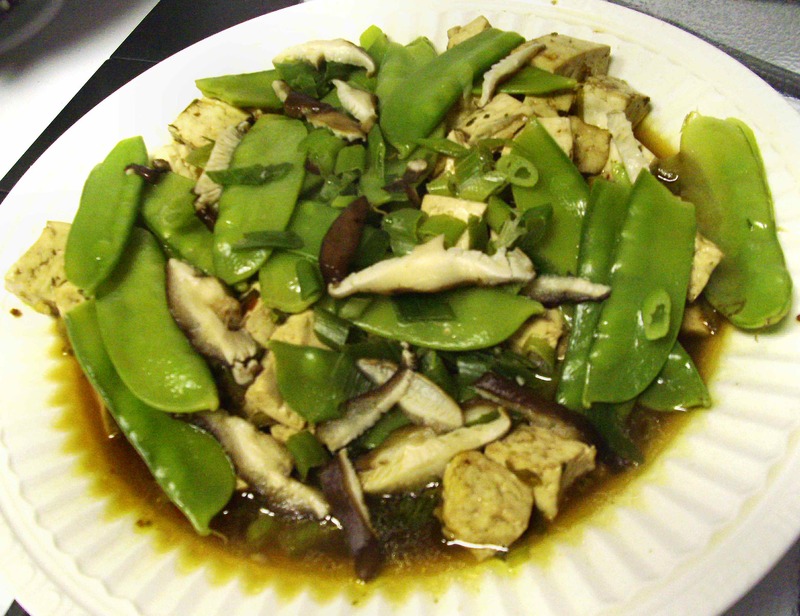 Korean or Thai peanut dipping sauce, especially if you stuffed your Nappa cabbage leaves with a combination of pressed tofu and/or omelet strips, spinach leaves, maybe some sprouts and shiitake mushrooms. Whatever version you do, this can either be a quick path to dinner (use the big leaves and more filling per leaf) or to a platter of appetizers (using the small inner leaves). Microwaving doesn’t develop every possible flavor (in the case of cabbage, I’m childish enough to say that’s a good thing), but it’s a quick way to play around with a classic at least on a trial basis. You could always do the huge foil-covered pan in the oven thing if you decide to scale up and go old-school. 1 lb (2 cups, more or less) of (in this case) allspice/cinnamon-spiced lentil hashu (made w/cooked rice or bulgur, not uncooked) OR peppery lentil mititei-style sausage filling (substituting 1/3 c. cooked rice for the wheat gluten), or your choice of savory/spicy filling, preferably one that includes some garlic…. 1. 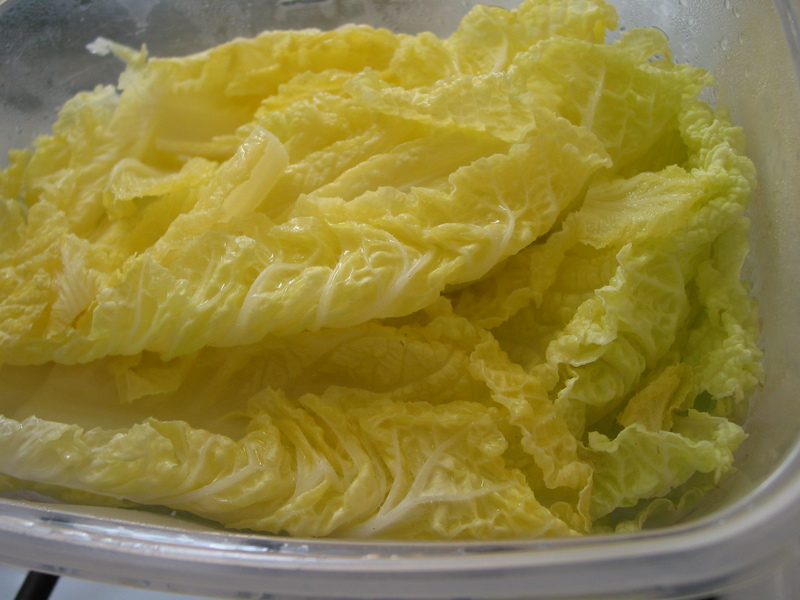 Separate the cabbage leaves, put in a microwave container, drizzle on a quarter-inch of water and put on a lid. Microwave 2-3 minutes until the leaves are just tender enough to roll without snapping the center. 2. Drain the leaves and lay them out on a plate for stuffing and rolling. Put a tablespoon of fairly stiff filling an inch or so from the stem end of the leaf and pack it into a little sausage shape. Roll the stem end over the filling gently but as tightly as you can manage, then tuck the side frills of the leaf over the ends and continue rolling toward the top of the leaf. Place seam-side down in a microwave container or casserole. Roll up all the leaves and pack them into the container fairly tightly. 3. 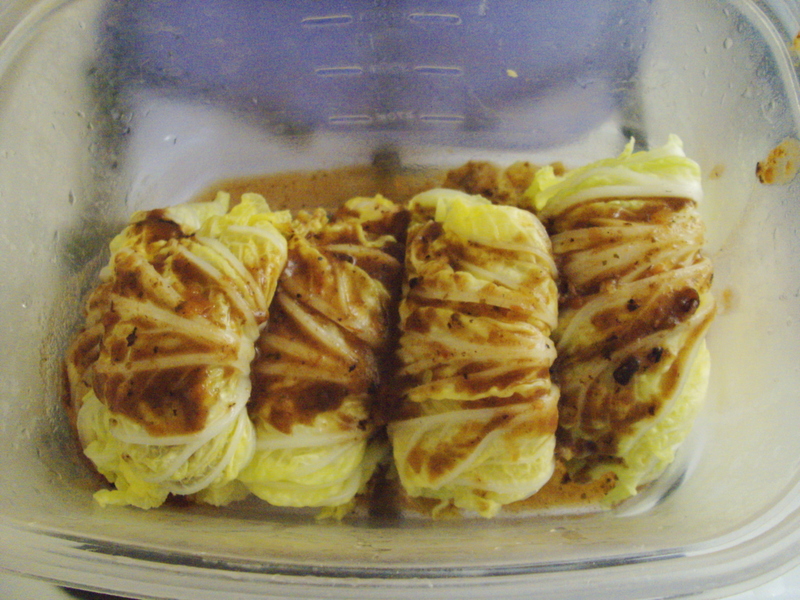 If the filling is completely cooked already (the rice in the lentil stuffing is not raw or par-cooked), just drizzle a bit of your sauce of choice over the stuffed cabbage rolls, maybe with a tiny drizzle of water in the bottom of the container. Put a lid on and microwave another 2-3 minutes or until just cooked through and steaming hot. If the flavor is still too raw or radishy for you, obviously you can cook it further, going a minute or so at a time, until it smells and tastes right to you. Drain and serve with a little more sauce on the side. When my husband and I were much younger, we stayed a week with the children of some friends who wanted to go off skiing on spring break. In preparation, the mother batch-cooked a huge dutch oven each of chicken breasts and brisket for the week–just for their two young children and us. She left elaborate instructions about how to reheat it (I’m not sure she trusted us to know how to cook anything). I can tell you that even in my 20s I thought that was an awful lot of meat, and by the end of the week we were really, really tired of it. Even the kids. I bring up these two friends because lately I’ve started running across Meals-for-a-Month how-to books. They pop up every once in a while in the cookbook aisles of your favorite bookstore (or the 641 section of your local library). They’ve been reappearing since at least the early 1970s, when a major recession under Nixon led people to rethink their household budgets. Now these books are back in “For Dummies” and “Everything” versions, complete with tie-ins to About.com and other popular web portals. The basic premise sounds ideal: shop and cook just once a month, the books promise, and you get a month of frozen real-food reheat-and-serve meals at your convenience, and you still save money. I keep hoping there’s some kind of solution in them for people short on time, cash and kitchen tolerance, but so far I’ve been disappointed. Read one of these books and you quickly realize why almost no one follows them for long. First, if you hate to cook, you’re going to hate cooking marathons even more. Especially if they look like all-kitchen circus-style nightmares of boiling chicken and roasting AND stewing beef and slicing ham and cheese while also cutting vegetables while mixing sauces while separately packaging just enough gingersnaps for each package of the sauerbraten (assuming you even like sauerbraten or know what it is anymore) and finding the right sized bags and labels and and and and…. If you batch-cook the way these books suggest (in the intro section “game plan” complete with NFL-style charts), your once-a-month cooking scheme will probably take you all weekend (shopping alone is a full day) and wear you out from dawn til dusk. One weekend a month. I bet this is where most people flipping through to see if it’s the solution to their dilemma quietly shut the book, put it back on the shelf and edge away as quickly as possible. These books also seem to replicate the worse aspects of frozen tv dinners, only without the convenience. The food’s too elaborate and long-cooking–mostly heavy meat stews and casseroles taken straight out of the 1950s Americana repertoire, and the scale-ups still only stretch to two or three meals for a family of four. If you go that route, you’d need ten recipes, and a huge freezer. Also, there are no, and I mean no, shortcuts. I’ve looked. Each main dish is an hour or more by conventional methods. The reheats alone typically take at least half an hour and some extra cooking steps–and this is after having thawed the packages overnight in the fridge. Have the authors never heard of a microwave? Wasn’t avoiding repetitive, excessive cooking the whole point of once-a-month cooking? Do you really want to have to plan so much and follow so many steps–especially if you’re on the ADD end of things? Or even if you aren’t. It would make so much more sense to simply buy a big resealable bag of frozen chicken parts and some bags of frozen vegetables and large cans of beans and tomatoes and boxes of spaghetti and relearn some cheap, easy and fast-cooking techniques from your college student repertoire. Wouldn’t it? Needless to say, this is not the way people who traditionally have to cook big on a tight budget cook. Most people don’t have as much money at any one time as they’d need to pay for a month’s worth of food in a lump sum, nor do they generally have a dedicated extra freezer to fit it all in. But batch cooking itself can work out and still treat you gently on a more modest scale. You just need to choose what makes sense to cook in multi-meal batches, and not do every possible big job all at once. Purim is here tonight, a little late thanks to the “leap month” this year (drawbacks to a lunar holiday calendar) but none the worse for it–it’s over 80 degrees here, which means it’s almost time for Purim. Los Angeles is the only place I’ve ever been, including Israel, where people were slathering sunblock on their kids and gasping for water bottles at a Purim carnival well ahead of lining up for hamantaschen and games. It was 94 degrees that year. Fifteen years of this and I’m still not used to it. 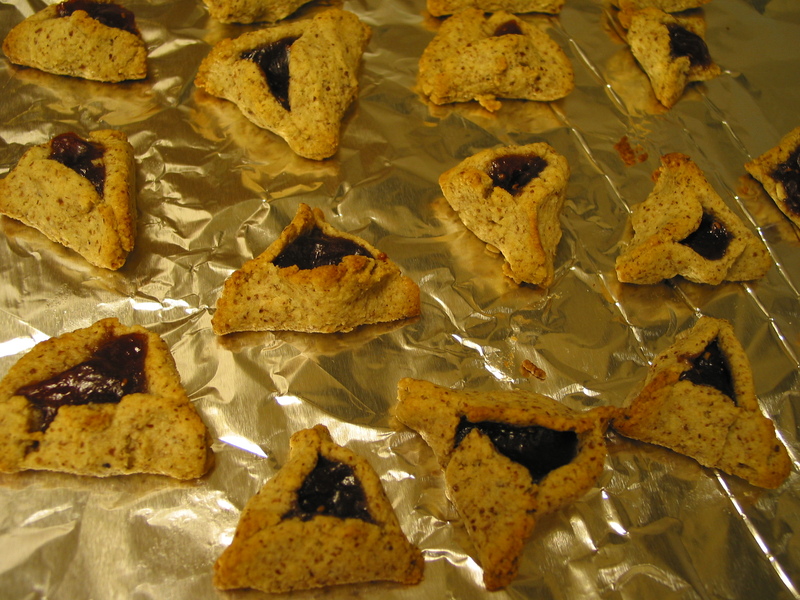 Purim, of course, means manic baking, heat wave or no, because the adults’ reading of the Megillah (the Book of Esther) had…ummmm….last-minute planning and no one thought about hamantaschen as part of the refreshments until midweek. I think I’m the only one left in our shul who still doesn’t care about having a fabulously original themed cocktail party for the adults afterward. Any kind of cocktail party is more drinking than I want to do, and I’m damned if I wanna dress up in full office battle array again after so many years sidestepping all the suits in my closet, just so I can fit in with the Mad Men theme. I’ve never even seen the show. But I actually make hamantaschen at home once in a blue moon instead of schlepping over to the Valley to buy them from a kosher bakery. So I did the stupid, crazy thing and volunteered. How many people? I asked–maybe 60. So I have SIX batches of dough sitting in my freezer relaxing. It took about half an hour, about 5 minutes apiece, to do all the batches in the food processor, one after another and weighing out the ingredients so they’d be consistent. And yet…after all the excitement from two weeks ago, I’m just not all that geared up to roll it all out and bake it just this minute. Maybe when things cool down slightly–half an hour? Maybe? Friday happens to have been Pi Day as well–and to my daughter, who was supposed to be my second-in-command for this delicate operation, and to her algebra teacher this morning, that meant Pie Day. They had about four different kinds of pie for all the math classes, and none of them had to calculate the areas or volumes of the wedges they sampled. My daughter, of course, was so elated that she ate two entire meals’ worth of carbohydrate in about fifteen minutes, and still came out with a pretty good blood glucose number an hour later–good on the calculated guesses, there–but at the cost of running through insulin that could have lasted her three or four more hours if she’d eaten an ordinary lunch. Teenagers! Mothers of teenagers! Still, not to lose the spirit of things too much. It occurs to me that hamantaschen qualify as very small pies, only triangular. So we eventually started the process of inscribing a triangle inside a circle–240 times, if we can get through all the batches before showtime. Me, I’d settle for 3 or 4 batches and call it a week. The raspberry jam filling–all that hard work for the first batch of rolling and filling–leaked all over the place. Too bad there isn’t still a vogue for vampire-everything; the first batch would have qualified! Too thin. You need a thick serious filling to stay in place during the baking. So–time to nuke the prunes for lekvar and the figs for the heck of it (plus toast a small sampling of the poppyseeds in my freezer to see if they’re still okay to use for a filling, and to make sure I don’t pour in the bag of nigella seeds instead by mistake!). I rarely see these anymore, but I still believe in doing traditional fillings alongside the modern, newfangled apricot-jam-and-chocolate-chip ones. It’s true that if we keep skipping the prune filling, we might not turn into our own grandparents, and if we miss out on the poppy seed filling (known in Yiddish as mohn) we might pass the all-critical drug tests (à la Seinfeld) with no interferences, but then again we’d miss the ta’am, and what’s the joy of hamantaschen without a taste of the past? However–if you are feeling “Mad Men”, you might think of reconfiguring the hamantaschen motif for cocktail party fare instead. I was thinking about this Thursday but figured it would be too weird. Then I saw an article about it yesterday in one of the big three newspaper cooking sections–dammit! scooped again! In any case, if you’re feeling a little avantgarde, you could do a batch of savory hamantaschen if you feel like it. Use rugelach, bureka or olive oil tart dough instead of the standard sweet dough. Roll it out fairly thin, and fill with feta or bleu cheese mixed with labne or very thick sour cream, plus a little onion and some thyme, maybe a pecan or two. Or something with very cooked-down mushrooms and onions (so they don’t get soggy). Or pesto and cheese. Or spinach with cheese and nutmeg and lemon rind. Or tapenade. Etc. Since Esther supposedly refused meat and ate only chickpeas, chickpea recipes are also more or less relevant to Purim. Mine are not particularly traditional–look up Iranian Jewish recipes elsewhere on the web. There’s also the possible “nahit”–fry chickpeas in olive oil, drain and sprinkle with salt and pepper. Or a cold chickpea salad with mint, scallion, garlic, olive oil and lemon juice or vinegar.